In my last post I discussed reasons why the FDA hasn’t kept us safe from dangerous drugs, either by approving those with questionable safety profiles (t-PA for stroke), or by failing to act when a drug’s widespread use reveals hazardous side-effects (Vioxx for inflammation). But this is not the only issue I have with the FDA. For seemingly nebulous reasons, the agency also occasionally removes or sanctions drugs with proven track records of safety. Consider droperidol (Inapsine): At low doses of 1.25 to 2.5 mg, the drug proves an excellent antiemetic, preventing vomiting in everyone from anxious, little-old ladies to food-poisoned, morbidly obese teenagers. At slightly higher doses between 2.5 and 5 mg, the drug not only relieves nausea, but works extremely well to treat migraines while also providing a welcome degree of mellowness. At high doses between 5 to 10 mg, the drug’s sedating properties take over, making it every ER physician’s best friend, capable of transforming the wide-eyed, psychotic rage of an angel-dust overdose into the calm, reptilian stare of a sated iguana in as little as 15 minutes. Oh, how I loved the drug! Prior to the FDA’s warning, there was never a shift where I couldn’t find a use for it. Anesthesiologists loved it, too. For decades, droperidol was the “go to” drug for post-op nausea. And, of course, patients loved it because it worked. And then the music stopped. First synthesized in 1961, droperidol is in the same class of drugs as the well-known, anti-psychotic medicine, haloperidol (Haldol). Both work primarily by blocking dopamine-receptors, but droperidol’s more rapid onset makes it the more useful in the ER setting. The drug isn’t perfect; it occasionally causes dystonia (an involuntary contraction or repetitive spasm of muscles, typically those of the face or neck), or akathisia (the “heebie-jeebies,” characterized by restlessness and an unpleasant ants-in-the-pants sensation). Both of these side-effects respond nicely to a rescue dose of Benadryl. It should be noted that other nausea drugs (e.g. Compazine, Reglan, and Phenergan) can induce these same side-effects at a rate equal to, or exceeding, droperidol. That isn’t what got the drug into trouble. Instead, it was an extremely rare side-effect resulting in a potentially dangerous cardiac rhythm known as torsades de pointe (literally a “twisting of the point”). This is a chaotic rhythm. It is not a good thing. Although it can usually be successfully managed with an infusion of magnesium, it can also be life-threatening. I have used droperidol literally a thousand times and never saw a patient develop this rhythm, nor do I know of anyone who has seen it in response to the drug. Nonetheless, I acknowledge the drug’s capacity to cause this side-effect in rare, seldom-seen cases. On December 4, 2001, the FDA sent doctors a “Dear Health Care Professional” letter announcing that a “black box” warning had been placed around droperidol. 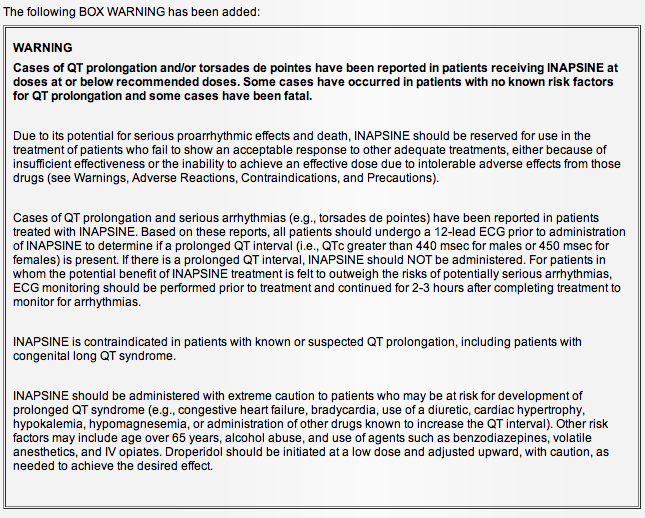 Akorn Pharmaceuticals, the sole US manufacturer of the drug, was required to highlight within a bold black box on all package inserts the FDA’s warning regarding the risk of adverse cardiac events, noting that the drug placed patients at risk when used “within and even below the approved range.” The agency further stated that all patients should receive a screening EKG before administration to look for certain patterns that might place the patient at increased risk for torsades de pointe, and then undergo continuous cardiac monitoring for 2-3 hours after administration. This quite literally proved to be the kiss of death for droperidol. In the 11 months preceding the warning, Akorn had sold more than 10 million vials of the stuff; afterward sales plummeted to near zero, dropping by more than 90%. Despite widespread belief among the medical community that the drug was both safe and effective, everybody I know stopped using it almost immediately. To practicing physicians, an FDA “black box” means that you won’t be safe from litigation should anything bad happen to a patient receiving the drug—even if that badness had nothing to do with the medicine. Fearful doctors everywhere dropped droperidol like a hive full of hornets. The drug simply wasn’t worth the chance of getting stung. But let’s take a look at the data. The FDA warning was based on 271 adverse cardiac events reported between Nov. 1997 to Dec. 2001, only a quarter of which came from the US. This represents an event rate of just 0.00007% in the US, an infinitesimally small number for a drug used 25 million times a year. Wait, it gets worse. A closer look at the case reports reveals that many of them were duplicates, reported separately by different agencies, leaving the actual number of deaths linked to the drug at 93. But, we’re still not done. More than half of the deaths were associated with doses of 10 mg or more, often as high as 50 to 100 mg used to control extremely agitated patients in Europe (read “batshit crazy”). We’re talking doses 20- to 40-times higher than the standard US dose to treat nausea and migraine. My interpretation of this data is not that the drug is dangerous, but rather that it is extraordinarily safe. Only a handful of patients receiving huge doses of the drug had any problems with it. How about Tylenol? Taking 20- to 40-times the recommended dose of that drug will kill you every time. Should it be “black boxed” or banned? The second case is also suspect; this one involved a 20-year-old man who received droperidol 5 mg for combative behavior after ingesting an unknown combination of illicit drugs. Are we really to believe that it was the droperidol, and not the effects of the street drugs that killed him? Then, there’s the 53-year-old man who died after receiving just 0.625 mg of droperidol for nausea. Unfortunately, the poor fellow also had a history of coronary artery disease, having undergone both prior coronary artery bypass grafting and coronary stent placement. Furthermore, lab work at the time revealed an elevated troponin indicative of a recent heart attack. Does the FDA actually think a piddling dose of droperidol killed him and not a heart attack? It’s instructive to ask who benefited from the warning? Droperidol’s competitors certainly did, and the one who benefited most was GlaxoSmithKline, the makers of ondansetron (Zofran). Sales of this drug went through the roof after the FDA warning. In just a few years, ondansetron became the leading selling anti-nausea drug in the US, with sales rivaling that of the opioid Oxycontin. Does ondansetron work better than droperidol for nausea, migraine, or agitation? Well, it doesn’t work for agitation, it’s a lousy migraine drug, and an okay antiemetic. You have to go back to the late 90’s to find any head-to-head trials comparing the two, but in one study they performed equally to prevent post-op nausea, while droperidol was superior to ondansetron in another study. In my experience droperidol wins, and most of my colleagues agree. In a 2005 survey, only 8% of emergency physicians believed that current sedation drugs work better than droperidol, while 49% believed they didn’t work as well. Safer? Nope. While initially touted as the safe alternative, it turns out that ondansetron is associated with the exact same cardiac issues that earned droperidol its “black box.” It, too, is capable of causing torsades de pointe. Cost? Now, that’s a good one. At the time of the FDA warning a vial of droperidol retailed for $0.88 compared to ondansetron’s $26.00. Wow! So for 30-times the cost, you got a drug that didn’t work as well and had the same serious side-effect as the cheap “black box” stuff? No thanks, give me back my droperidol. So who was that anonymous source who reported all of those cases to the FDA back in 2001? Who knows, but GlaxoSmithKline has a track record of shenanigans when it comes to their drug. In the mid-90s, when ondansetron was establishing itself as an up-and-comer, a series of manufacturer-sponsored trials were published documenting the drug’s effectiveness, but it turns out that 9 of the studies contained snippets of covertly duplicated patient data placed to enhance the drug’s efficacy profile when combined in a meta-analysis. Shame times 9. Now after 15 years, there’s a movement afoot to get the FDA’s “black box” warning lifted. A few brave souls are using the drug again, and, in 2015, published a study documenting the drug’s safety and efficacy in managing more than 1,400 acutely agitated patients without causing a single episode of torsades de pointe. It’s time to bring this drug back. Jack Perkins and Jeffrey Ho, “Clinical Practice Statement: Safety of Droperidol Use in the Emergency Department,” AAEM Board of Directors, 09/07/2013. Zane Horowitz et al., “Droperidol—Behind the Black Box Warning,” Acad Em Med 2002; 9 (6): 615-8. W. Kao et al., “Droperidol, QT Prolongation, and Sudden Death: What is the Evidence,” Ann Em Med 2003; 41: 546-58. Ashrat Habib and Tong Gan, “Food and Drug Administration Black Box Warning on the Perioperative Use of Droperidol: A Review of the Cases,” Anesth Analg 2003; 96: 1377-9. Cherry Jackson et al., “Evidence-Based Review of the Black-Box Warning for Droperidol,” Am J Health-Syst Pharm 2007; 64: 1174-86. Jun Tang et al., “A Comparison of Costs and Efficacy of Ondansetron and Droperidol as Prophylactic Antiemetic Therapy for Elective Outpatient Gynecologic Procedures,” Anesth Analg 1996; 83: 304-13. Robert Hill et al., “Cost Effectiveness of Prophylactic Antiemetic Therapy with Ondansetron, Droperidol, or Placebo,” Anesthiol 2000; 92: 931-3. Jeanne Jacoby et al., “After the Black Box Warning: Dramatic Changes in ED use of Droperidol,” Am J Em Med 2005; 27: 196. R. Tramer et al., “Impact of Covert Duplicate Publication on Meta-Analysis: A Case Study,” BMJ 1997; 315 (7109): 635-40. Leonie Calver et al., “The Safety and Effectiveness of Droperidol for Sedation of Acute Behavioral Disturbance in the Emergency Department,” Ann Em Med 2015; 66 (3): 230-8. This entry was posted in Uncategorized and tagged droperidol, FDA, Inapsine. Bookmark the permalink. Wonderful post. Thoughtful and clear. Are there other sources to track down whatever game was played? Do you cover this in detail in your book? Why didn’t Akron sue or appeal? Im looking for examples for my book. Thank you. There are a number of published articles about the droperidol debacle accessible through Pub Med. Lenzer’s new book, “The Danger Within Us: America’s Untested, Unregulated Medical Device Industry and One Man’s Battle to Survive It.” Although the topic here is the medical device industry, which is under different oversight than pharmaceuticals, the book provided an eye-opening perspective on just how snug the relationship has become between industry and the FDA.